I laughed when my minister asked how we would manage our relationship with our parents once we were married. “Mate! Not an issue. We live 1200km away.” I soon found our parents were living right there with us. It took a while longer, but I discovered some of my grandparents’ issues pushing their way into our relationship. When we arrived at the first congregation I served, my wife was held responsible for the faults, real or imagined, of previous clergy wives. Society loads us with its hopes, fears, and assumptions, when we marry. And then there are the folk who, without realising, seem to pin their hopes on us for some kind of validation in their own lives. They react with anger and condemnation that makes our life even harder if we don’t make a success of our marriage; somehow our imperfection assaults them. I adored the woman I married. But I had to learn that this person with whom I identified so closely, attracted me partly because she carried traits of character that I wished were mine. I looked for her to fulfil what I needed to be. I had to grow up, and find and grow into those things, instead of depending on her to complete my life. But mixed with those discoveries is the very real sense in which she does complete my life. We are friends and life companions; marriage is about these things. I am still on the journey of discovering things I should be doing for myself. The issues of loss and disconnection, and of maintaining my identity if we were to part company, are intellectually and emotionally mind-boggling if I consider them. I don’t know how I would cope with that! When friends divorce, it always frightens me. When folk are divorced or remarried we often project such fears onto them. Sometimes those who feel unable to leave a relationship pour irrational anger upon those who have been able to leave. Or deeply grieving folk can be devastated by the relief of friends at their leaving a bad marriage. No one gets married with the intention of a divorce. All this happens because if we are married it goes to the centre of who we are. In the creation stories there are sayings like: “it’s not good for the human one to be alone,” and “from the beginning of creation, ‘God made them male and female.’ ‘For this reason a man shall leave his father and mother and be joined to his wife, and the two shall become one flesh. '” (Genesis 2:18, Mark 10:6-8, quoting Genesis 1:27 and 2:24). Such sayings reflect our ancient wisdom that being in relationship with others humanises us. It is not healthy to be cut off from others. We who are married should remember that such humanising relationships don’t require marriage, much less a piece of paper issued by the state. The married often act as though single folk are lesser beings. And act as though relationships that don’t fit their norms are somehow inferior, or even wrong. So what are we to make of the scripture in Mark 10 where Jesus talks about divorce? Firstly, it was allowed. People knew things didn’t work out. Deuteronomy 24 even presents us with a case of multiple divorce and remarriage! Divorce is not God’s ideal, but it is how life sometimes turns out. I once said of a parishioner who was criticised for leaving a marriage that “when a woman is able to escape a marriage like that, Jesus says, ‘Sister, welcome to freedom! '” I’ve met men to whom he has said the same. Yet is clear Jesus did not like divorce, and especially did not approve of remarriage. He was stricter than the Old Testament in the latter. I’ve quoted this to highlight the amazing thing Mark does with the Jesus tradition when he is writing 30 to 40 years after Jesus’ death. He does not hold us to this. If we read the text closely, Jesus is not teaching about divorce. Why does divorce pop up here in the text? It’s out of place, almost as if someone dropped a stack of index cards and put one back in the wrong order. If we read carefully, we will see they have slid it into the middle of conversation where Jesus is teaching about children! In the rhetorical style of Mark’s time the repetition of taking them in his arms links 9:36 and 10:16 together. It is the way the author tells the listener or reader that the stuff in between is part of the one package to be read as a whole. Let’s start with the children as we continue to seek why a teaching about marriage and divorce was placed here. The children are at the centre of Mark’s key teaching based around the three predictions of Jesus’ death. “These are the three signal teachings about the Messiah in the centre of Mark“: they teach us what it means to be Messiah, what it means to follow the Messiah and, therefore, what it means to be church. If we don’t understand these teachings, we don’t understand Jesus very much at all. But the disciples are still rejecting the children. (Mark 10:13) They have not yet seen clearly. And the disciples are us. The change of location, while the children remain at the centre, is deliberate. Jesus is going outside the boundaries: he “went to the region of Judea and beyond the Jordan.” (Mark 10:1) Judea signifies a speaking to the people of God, but the boundaries of who the people of God are, are being challenged, because by being beyond the Jordan, he is outside the boundaries of the Promised Land. The Messiah has stepped outside the boundaries and alliances by which his people define themselves. The message is this: the Kingdom of God, which he has come proclaiming, has no boundaries, no walls. Jesus does not raise the issue of divorce, the Pharisees do. Maybe the Pharisees of Mark’s time were saying Mark’s church was too soft on people who were divorced. In any event, Mark’s Jesus uses their complaint to highlight his concerns about the children. What will the kingdom of God be like? Will it be a place of insiders and outsiders? Will the church be about boundaries and walls and defence of our faith and being? Or will the church be about highlighting the central graces of the faith, and shining a light on God’s love? The children, the little ones outside the boundaries, are the touchstone in all this. If our light shows there are people outside, people we are rejecting, then we have the wrong light. We are not the light shining on a hill but something less than that. If we close our hearts to some people, if we restrict access to God to those who meet our legal requirements, if we build walls to exclude, if we form alliances against, if we pretend to be superior— all this closing and hardening of hearts will prevent us from being opened to the words and the love which would save us! And on the other side of the walls we have built, will be the ones we excluded, where Jesus will take them up in his arms, lay his hands on them, and bless them. But if we follow Jesus outside the boundaries and alliances by which our less than best selves so often exclude others, the blessing is also ours. There is something wonderful here. Jesus elevates marriage even above the expectations of the Old Testament law. But then elevates the love of God for us even above that! As church we are forbidden— it would be better if a millstone were hung around our necks and we were thrown into the sea— we are forbidden to reject people, because Jesus did not reject them. He took the failed children of God and held them in his arms and blessed them. He holds us. Each year, the Palestine Israel Ecumenical Forum of the WCC invites member churches, faith-based communities, and civil society organizations around the world to join together for a week of prayer, advocacy and action in support of an end to the illegal occupation of Palestine and a just peace for all in Palestine and Israel. This year’s theme is “God has broken down the dividing walls”. The General Secretary of the World Council of Churches (WCC), Rev Dr Olav Fykse Tveit, said, “It is our sincere desire and prayer, shared with many Jews and Muslims, that there should be no hostilities among neighbours in Israel and Palestine, and beyond, in the whole Middle East region”. It’s time! It’s time for the international community to implement more than 60 years of United Nations resolutions. It’s time for people who have been refugees for more than 60 years to regain their rights and a permanent home. It’s time for people living more than 40 years under occupation to feel new solidarity from a watching world. It’s time to be revolted by violence against civilians and for civilians on both sides to be safe. It’s time for both sides to release their prisoners and give those justly accused a fair trial. It’s time to reunite the people of Gaza, the West Bank and East Jerusalem. It’s time for all parties to obey international humanitarian and human rights law. It’s time to share Jerusalem as the capital of two nations and a city holy to three religions. It’s time for Muslim, Jewish and Christian communities to be free to visit their holy sites. It’s time in Palestine as in Israel for olive trees to flourish and grow old. It’s time to honour all who have suffered, Palestinians and Israelis. It’s time to learn from past wrongs. It’s time to understand pent-up anger and begin to set things right. It’s time for those with blood on their hands to acknowledge what they have done. 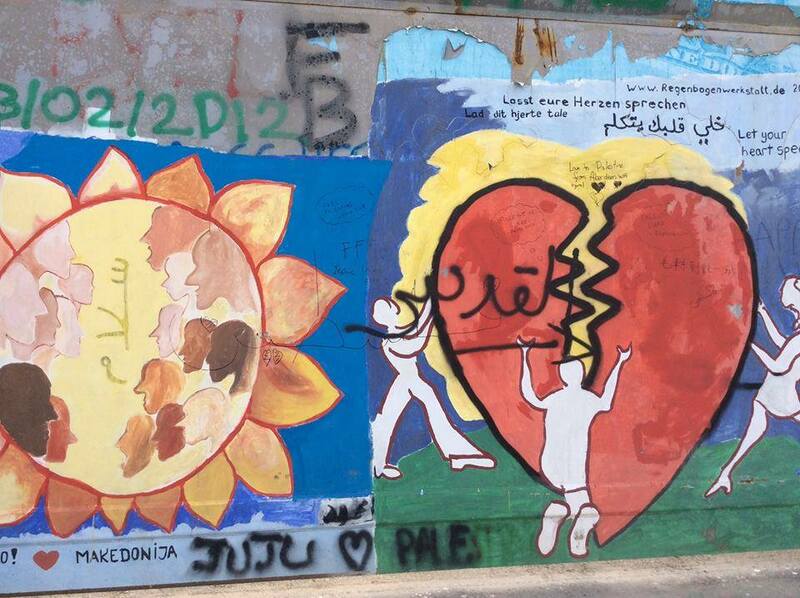 It’s time to seek forgiveness between communities and to repair a broken land together. It’s time to move forward as human beings who are all made in the image of God. In the news the desperate situation of refugees seems to worsen. Pacific Islands face destruction while our politicians joke and refuse to address the issue of climate change in meaningful ways. How are we to work together with people of good will for some kind of justice? How do we sort through the competing ideologies we bring to the situation? What gifts might we Christians bring to the situation? And how is it that some who bear the name Christian have such vastly different responses to issues like these? In the meeting of ideologies, I do not see that disagreement ultimately depends upon whether one is Atheist, Muslim, Christian, or holds to some other persuasion. There is a more basic attitude about the meaning of life that cuts across these traditions. The first path… when we remove all the niceties, [says] life is about looking after number one. All of us are conflicted in this. Some who seek to live lives of compassion and generosity can nevertheless be amazingly selfish. Others, whom we may have judged to live purely for themselves, can show compassion and generosity that shames us. Even so, there is an emphasis in each of our lives. We have a basic value orientation about the purpose of our life. This value will influence our response to the needs of others, and will influence the way we work with others. At very base we believe either that the world is here for us, or we believe that we are here for the world. This transcends ideologies. Within any belief system, there will be adherents who, basically, are travelling along the first path as they seek to make sense of their life and the world. Others in the same group will see that meaning and understanding— even fulfilment— lie in living for the common good. When we seek to do good in the world, will we seek partners who merely use a name like ours— members of our tribe, as it were— or will we seek partners who follow the same path? If we can look past our traditions to our basic values, we may find we have more in common than we imagined. In the article I reference above, I suggest that we Christians have two distinctive characteristics as a group. One, of course, is [our] attachment to Jesus of Nazareth. He is seen as the model, the pioneer, the acme, the one upon whom to disciple oneself. He reveals God to us; living life his way opens us to the reality we call God. The other characteristic is found in what we could call [our] extreme adherence to the notion of the common good. The Good is firmly based in community with all people, not in the achievements of the individual self. The Good relates to community of all people with the biosphere itself, and even the Cosmos. We might … call it living in just harmony, or sustainably with all creation. Like most who follow the second path in life, Christianity has much to repent here. Christianity is not about “enlightened self-interest.” The common good is not something to support because it helps me. It is not a means to my ends. The common good is, for Christianity, the ultimate development of Humanity. There is no Humanity without the common good. The problem is that this way of being which is not focussed on my-self is at odds with my history. He says that if we want to follow him into this project we must “carry our cross.” The Romans forced those who were about to be crucified to carry their own cross to the place of execution, usually through the jeering crowd. This is not a trivial metaphor. It calls us to suffer ridicule and abuse, and even to risk death, in our determination to love our neighbour as ourselves. Perhaps our apprehension of the meaning of the cross— the pun is intended— can be our gift to the world. How can we rich Australians do anything meaningful about climate change, or for refugees, unless we put ourselves last, and make ourselves servants of all? We can only do this if we “die to ourselves,” let go of our false securities, and live for something greater. We have seen what this loss of ourselves does. It gives life to the world. The servanthood of an Emmeline Pankhurst or a Nelson Mandela changes the world in which they live. Such servanthood is where our humanity flourishes. Anyone can do it, but servanthood is our particular calling as Christians. 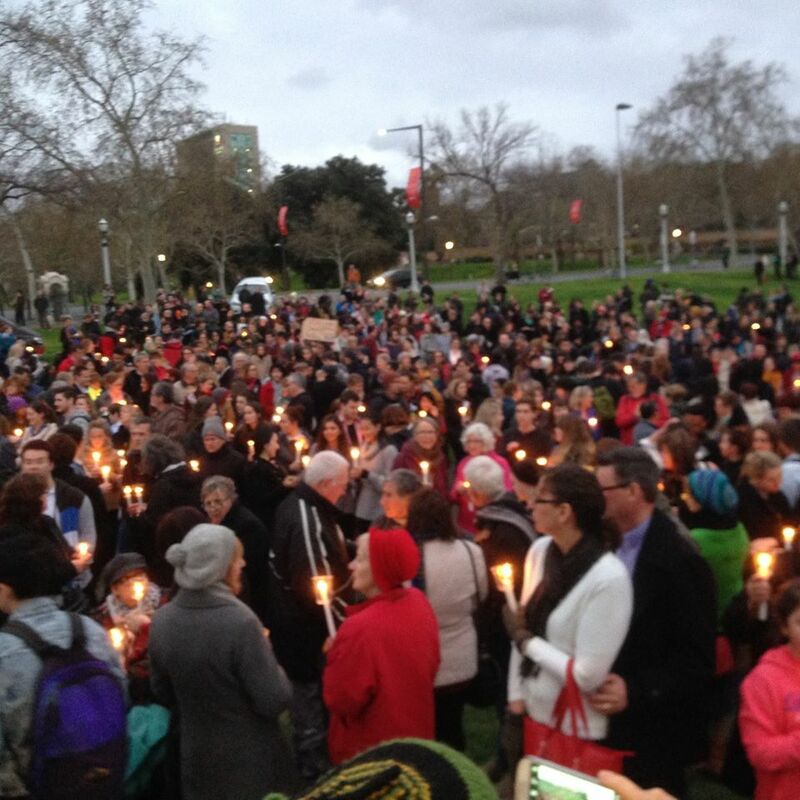 Tens of thousands of people attended candlelight vigils – #LightTheDark – around Australia on Monday 7th September to urge action on the humanitarian crisis arising from the Syria conflict, and to lament the death of Aylan Kurdi, his brother and mother, all washed up on a Turkish beach last week. Many more have died in an attempt to flee war and terror in Syria. (Photos here). ‘It is better to light a candle than to curse the darkness’. Friends, we gather as people of goodwill, as people who yearn for a world where all have safety and shelter, a world where leaders lean towards peace and seek the common good for all. We gather to lament, to express sorrow for lives cut short and families fractured, and to show compassion for those innocently caught up in the tragedy of war and the cycle of violence. 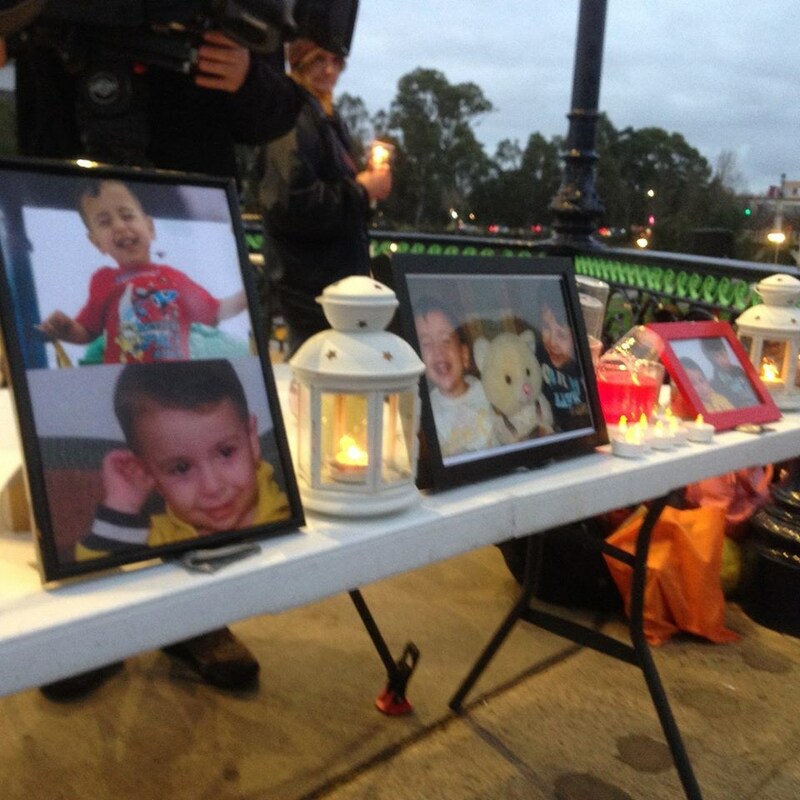 We gather with heavy hearts to remember 3 year old Aylan, his 5 year old brother Galip and his mother, Riham – and Abdullah, father and husband, who has lost everything precious to him. Now he just wants the world to really see the plight of the refugees. His impassioned plea is: Let this tragedy be the last. Generous hands are blessed hands because they give bread to the poor. Don’t walk on the poor just because they’re poor, and don’t use your position to crush the weak. May these ancient words of wisdom inspire us today – and be a call to our leaders, and our nation: to live with more generosity, to not walk on the poor and the disadvantaged and vulnerable just because of the position they’re in, to not use the position of privilege and power to crush those losing hope. Together, we share much wisdom here. It is we who can open ourselves to extend generosity, to cradle hope, to show compassion, to offer love and acceptance. To embody the ancient wisdom of ‘loving your neighbour as yourself’. We long for this wisdom to be at the heart of our community, our nation and our global village. Even so, nothing can deter people of goodwill who defiantly commit to seeking the common good for all. Now is not a time to be shy, or reticent or cautious. This is a time for determination, for solidarity, for action. It is in our hands to do what we can with what we have, to change the conversation we’ve been having in this nation, to recognise our inter-connectedness in our global village rather than foster division and disconnection. To welcome the stranger rather than treat them with indifference. To affirm the dignity of humanity rather than denigrate. In Europe, we watch as football fans hold aloft huge signs at football matches: we welcome refugees. We watch as the authorities in Rome ask people to stop bringing food and water to the train station, for such has been the generosity of the people that supplies are overflowing. We watch as the flood of refugees traipse along highways, with locals ready to offer fruit, water, and food and snacks to them. Or to offer them rides to their destination. We watch as refugees are clapped by local people as they arrive in towns and cities. I like to think that each clap is like a a prayer, a blessing, for each of these refugees. It is the ordinary people leading the way, extending love and compassion to these vulnerable, tired and anxious refugees. But even the politicians are showing extraordinary leadership. The Prime Minister of Finland says he will offer his own house to refugees. He said, it is easy to outsource everything to the society (government). But, society has limited possibilities. The more citizens are active, the better. An asylum seeker “deserves human treatment and a genuine welcome greeting. I ask everybody to stop all the hate speeches and concentrate on taking care of people who are fleeing from the war zone, so that they feel safe and welcome”. Let it be so. We watch as the Pope offers to shelter refugee families who are “fleeing death” from war or hunger, and has called on Catholic parishes, convents and monasteries across Europe to do the same. He said, “Faced with the tragedy of tens of thousands of refugees who are fleeing death by war and by hunger, and who are on a path toward a hope for life, the Gospel calls us to be neighbours to the smallest and most abandoned, to give them concrete hope”. This is a call that transcends borders and boundaries and even religious traditions. And so we watch to see what our own nation will offer in response to this humanitarian crisis. We are ordinary people, with an extraordinary capacity to support refugees. We know all too well the fragility of hope, and yet we also claim the strength and determination of spirit to act for the welfare of those fleeing war, violence, destruction and persecution. Let us therefore do what we can, with what we have. And let us do it together. It can start with the simplicity of offering a place of safety – as a community, as a nation, and in our hearts and homes. My attention was taken today by a coalition of people who have formed a Facebook group, Aylanslist, with the goal of collating a list of 11,000 Australian homes who are prepared to welcome one or more refugees to live with them while they get established. Might that be something you can be part of, or know someone with space in their home to welcome refugees? What will you do with what you have? We have gathered, and we will disperse, but let us stay strong together in spirit, and do what we can with what we have. Together, with open hands and open hearts, it is enough. This is a serious question. In all the variety of Christian expression some folk may imagine a Jesus whom we struggle to recognise as Jesus at all. But he is the distinguishing mark of Christianity compared to other religious faiths. And to ask seriously and honestly, “What would Jesus do if he were here, in my shoes?” can be a life changing experience. Sometimes we discover he simply would not wear our shoes! We will have heard the doctrinal shorthand about Jesus Christ being “fully human and fully divine.” “Fully human” means he really was a human person. Just like us, he knew anger, pain, envy, disappointment, rejection. Jesus reveals to us what God is like. And he also reveals to us how a human being just like us can relate to God. Under pressure, he heads north out of Galilee to Tyre. This coastal city was in Gentile territory. In the time Mark was being written “the Tyrians were the bitter enemies of the Jews.” (Matthew’s telling of this story identifies the woman as a Canaanite; that is, as a native of the land which Jesus’ people had invaded and over run.) Perhaps Jesus is over tired, for when she arrives with her plea for healing he is “caught with his compassion down,” as Carl Gregg puts it. The story shows us a man from the dominant conquering culture calling an aboriginal woman a dog. The Greek form of the word “dog” could be translated as “puppy.” Was he simply testing her, and being a bit playful, some people have wondered— perhaps he said it teasingly, with a smile on his face? I wouldn’t call my Sudanese friends little black puppies in any circumstances— the condescension makes it worse! The uncomfortable fact is that the Jesus we look up to is shown responding with what sounds like a stock racist excuse used to avoid ordinary human obligations toward Gentiles. It’s just as clever as the ‘witticism’ of the racist axiom that Jesus had probably learned as a village child. It opens his eyes. He is appalled at his own lack of compassion. He sees what all his teaching about God’s compassion and inclusion implies: God’s mercy is not just for the children of Israel! There are no ‘dogs,’ there are no outsiders; there are only people of God. We all pick up the shadow side of our culture. It begins to stick to us along with the dirt in the playground when we are little children. Our church and school and family give us a way to see the world, and they close our eyes to other ways. We inherit the shortcomings and failings of our people. We would not be human if this did not happen. It’s how the world works. Our sin— our falling short of what God hopes of us and for us— is not defined by our blindness and ignorance. Our sin is defined by our response when our eyes are opened. Jesus was, as my children would say, publicly ‘schooled’ by this woman. The rabbi with the legendary debating skills was beaten by a gentile woman, humiliated. Sin is when he gets defensive and attacks her like men so often do when women expose our shortcomings. Sin is when he makes a mealy -mouthed half-apology and goes on behaving just the same. Sin is when he explains to her that she doesn’t really understand what God is about; he is not racist, she’s just an ignorant woman who doesn’t’ see the complexity of the world. Except he does none of that. “For saying that, you may go—the demon has left your daughter.” Mark’s text is typically lean, but it’s clear Jesus not only accepts the truth of what she says. He praises her for it! No excuses. No hesitation. Instant repentance. Repentance means changing how we live, and he does. He heals the child. What would Jesus do? He wouldn’t be perfect. He would listen to the ones who are downtrodden. He would be compassionate. He would own up to the times when he was wrong, or blind to injustice— even his own. I find this incredibly encouraging and hopeful. It means I don’t have to be perfect. It means I am allowed to be wrong. It means I am not following an impossible act. I am simply asked to learn and to change. That is what Jesus did. I can do it. Jesus does something else in this week’s reading. His actions are completed in the beginning of chapter 8 in the event we call The Feeding of the Four Thousand. That story is not included in the lectionary, which jumps ahead to the crescendo moment at the end of Chapter 8 in Mark when Peter recognises that Jesus is the Messiah. We will miss something of what Peter sees if we don’t understand what Jesus does after Tyre. 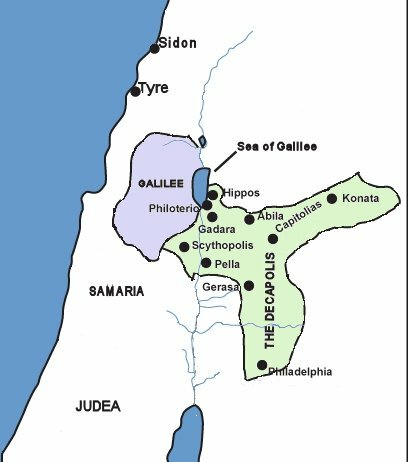 After healing the little girl it says Jesus “returned from the region of Tyre, and went by way of Sidon towards the Sea of Galilee, in the region of the Ten Cites.” (Decapolis means ten cities.) Looking at a map of the time, that’s like saying he’d gone from Adelaide up to Clare, and then taken the short way home by going on to Peterborough, and coming back to Adelaide via Burra and Murray Bridge! Jesus’ criss-crossing of the country here, and in other stories, has led people to wondering if Mark knew the geography of Palestine at all. Perhaps he was just putting stories together whilst not realising that Jesus was ‘all over the place.’ But Mark knew what he was doing. He begins with an introduction to Jesus and then has Jesus moving across the land of Israel healing and teaching. I’ve already spoken of Jesus’ going back to the old prophetic roots of Israelite faith and telling of a God who cares for the ordinary people, and who desires justice and peace for all people. Those actions meant that the readers of Mark instantly heard echoes of the Time of the Messiah in the story of Jesus feeding the 5,000 people in chapter 6. That feeding was an acting out of the great messianic feast which many people expected would come with God’s Kingdom. And unlike me when I first read the story, Mark’s readers recognised Mark was telling the same story again in chapter 8. They saw the numbers were changed! And they saw that the feeding of 5,000 was a “Jewish” story and the feeding of 4,000 was a “Gentile” story. (You can read details about this here.) And then they may have noticed that once he has fed the 5,000 Jewish people, Jesus then goes off and heals and ministers to the Gentiles and feeds them! In other words, by the time Peter recognises the obvious— that Jesus is the Messiah— we have been shown the Messiah is for both Jews and Gentiles, and ministers to them all. After Tyre, Jesus goes on a road trip through Gentile country healing and ministering there. We can miss what this involves. We can simply say he did more miracles. But what have we learned in our time about our healing when we are driven by things inside us, and forces outside us? Whether we are the person at the traffic light who pointlessly sits on their horn in gridlock, or are a violent spouse, or are struggling to live with serious brain malfunction as we are stabilised in the mental health ward, there is one constant in our healing. It is people who take time to honour us with their attention and compassion; people who simply care for us. That kind of caring only comes from listening to the world of the one who suffers. It means being immersed a little in their world. That’s why we talk about the ministry of healing. Ministry means serving. It means honouring by listening. So while Mark’s key concern in showing us Jesus’ road trip is to make the connection that Jesus is for Gentiles as well as his own Jewish people, he has uncovered other truths for us: ministry takes time, and ministry listens. These things are at the root of healing. So what would Jesus do? Instead of making a quick, embarrassed apology to the one he had wronged, and then retreating, Jesus would give them time. Jesus would immerse himself in their reality. He would honour them by ‘visiting country.’ He would not pay lip-service to an issue and move on. He would immerse himself in it. Would we? You can listen to a podcast of this commentary here. Mark 7:24 From there he set out and went away to the region of Tyre. He entered a house and did not want anyone to know he was there. Yet he could not escape notice, 25but a woman whose little daughter had an unclean spirit immediately heard about him, and she came and bowed down at his feet. 26Now the woman was a Gentile, of Syrophoenician origin. She begged him to cast the demon out of her daughter. 27He said to her, ‘Let the children be fed first, for it is not fair to take the children’s food and throw it to the dogs.’ 28But she answered him, ‘Sir, even the dogs under the table eat the children’s crumbs.’ 29Then he said to her, ‘For saying that, you may go—the demon has left your daughter.’ 30So she went home, found the child lying on the bed, and the demon gone.